The new nano also benefits from some other features introduced in iTunes 9, including Genius Mixes. Previously, iTunes scanned your music to compile Genius Playlists based on a song you selected, which paired it with other, similar music. Along the same lines, Genius Mixes just make up a series of up to a dozen ready-made playlists from your music to help you discover tunes you have but don't regularly listen to. No need to pick out a seed song for iTunes to base your Genius Playlist on; iTunes just compiles several lists for you so you have ready to go mixes that are digitally computed to play well together. 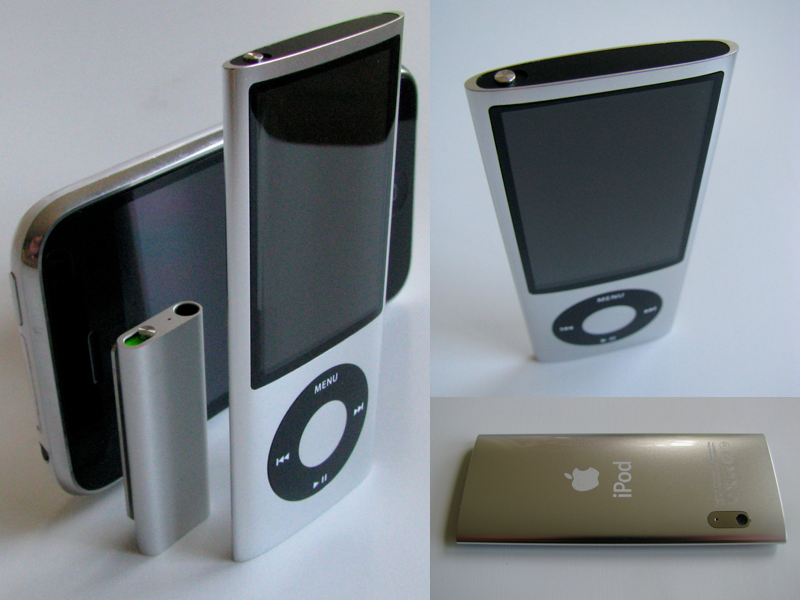 The new nano carries forward previous features, from Cover Flow album browsing to synced photo viewing and TV slide shows; simple iPod games, which now number up to four dozen in the iTunes store in addition to the three included for free; voice memo recording, which now works using the new built-in mic; and the mini apps ranging from the stop watch and alarms to the synced calendar and contacts. Both nano models come in a spectrum of 9 different colors: silver, black, purple, blue, green, orange, pink, along with (PRODUCT) RED and orange, which are exclusively available through the Apple Store. The colors are similar to last year's spectrum but generally darker and more serious looking than the powdery rainbow "nano-chromatic" colors introduced last year. The deeper blue, forest green and rosy pink versions are the most noticeably different shades this time around, but all of the colors sport a glossy new clear coat finish that sets them apart. All have a white click wheel apart from the black and silver models, which sport a black click wheel. The 16GB model holds up to 4,000 songs, 14,000 photos, and 16 hours of video, and the 8GB model holds up to 2,000 songs, 7,000 photos and eight hours of video. Capacities are unchanged over the previous generation. While using the same shell size, the new 5G nano has a slightly larger 2.2" display (versus the previous 2.0" screen on earlier nanos) with a few extra lines of resolution, 240x376 versus the previous model's 240x320. This gives the new nano more pixels than the latest iPod classic, and a screen nearly as large as the classic's unchanged 2.5" display. The new nano also sports what Apple calls a "TFT display" as opposed to the "color LCD with LED backlight" used on the latest classic. The new nano screen seems to be noticeably brighter. Despite the new larger screen, camera, mic, speaker, radio and other hardware features, the new nano is also slightly lighter than the previous model, at 1.28 oz rather than 1.3 oz. The click wheel is ever so slightly smaller than the previous version by a millimeter or two. Battery life is still rated at 24 hours of audio playback, but video use has increased from 4 hours to 5, matching the rated life of the earlier, squatty third generation nano. 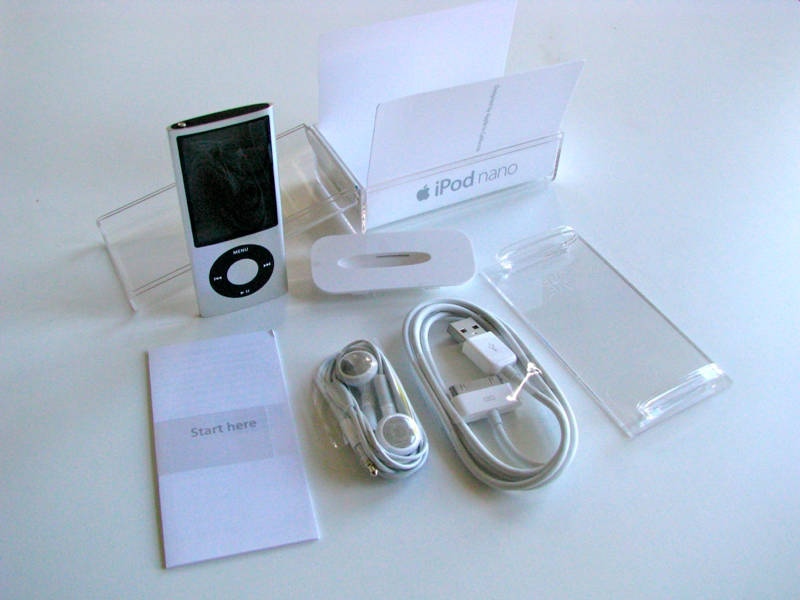 The new nano comes in the same plexiglass case with the standard stickers, a thin guide, a Universal Dock adapter, standard earbud headphones (no mic, no playback controls), and a USB to dock connector cable. There's no power adapter or dock or, in a nod to Apple's increasing environmental efforts, any other superfluous packaging. The new nano is also advertised as having a recycle-friendly aluminum design that uses arsenic-free glass, and no Brominated Flame Retardants, mercury, or PVC plastics. The 8GB nano retails for the same $149 as the previous video camera-free model, while the 16GB model is twenty bucks cheaper than last year's at its new $179 price. 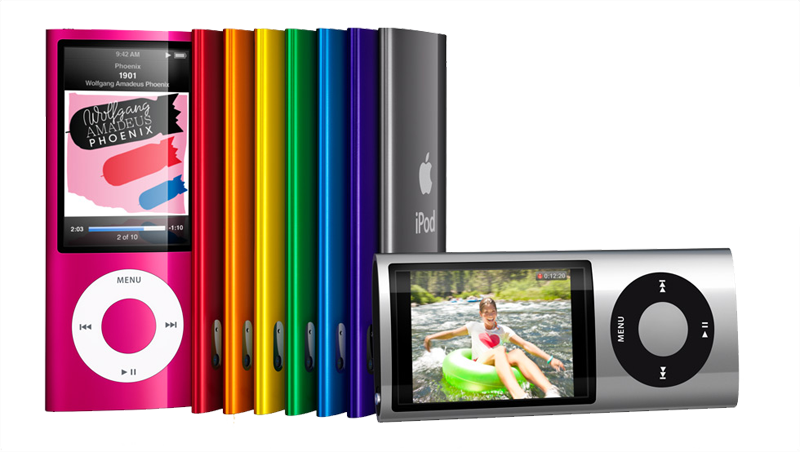 That distinguishes the sporty, video capturing iPod nano from its gaming-oriented, web browsing, multi-touch big brother, which now drops down to hit the magical $199 price point with its low end 8GB model. With the latest 5G iPod nano, Apple has taken its most popular iPod and given it an entirely new use as a pocket sized video camera. The new step counter and FM radio shore up its gym-savvy, and new Genius Mixes make it all that more effortless to find collections of songs to listen to from your own library. What's missing? Apple didn't include its mic-integrated headphones with playback controls, but it did include a new integrated mic that works well enough for both voice memos and video recording to avoid making a headphone upgrade essential. The missing hour of battery life we counted against the previous nano is back, along with a lower price on the 16GB model. The new 5G iPod nano shows Apple isn't content with selling last year's products, and is constantly working to deliver desirable new features in the same sized package at the same price. Anyone in the market for a slim, easy to use MP3 player should be extremely satisfied, particularly with its fun new camera and other hardware upgrades. Great new video capture with fun special effects. Audio recording using an built-in mic and speaker for playback. High quality, larger, bright 2.2" screen. TV output for slide shows, movie rentals and downloads.